Trump’s Latest Executive Action Could Alleviate A Huge Problem For The World’s Most Productive Oil Field | Watts Up With That? The Permian basin, now the world’s most productive oil and gas field, is booming — so much so that there’s not enough pipeline capacity to carry out all the natural gas it produces, meaning much of it is flared. How much? Some 553 million cubic feet per day, or enough to power every home in Texas, according to data from Rystad Energy compiled by Bloomberg. More natural gas will be flared off rather than brought to market if the trend continues. That’s a problem President Donald Trump is looking to tackle. Trump signed a pair of executive orders Wednesday aimed at expediting oil and gas pipelines, including asking the Environmental Protection Agency to clarify how states and environmentalists can challenge Clean Water Act permits. 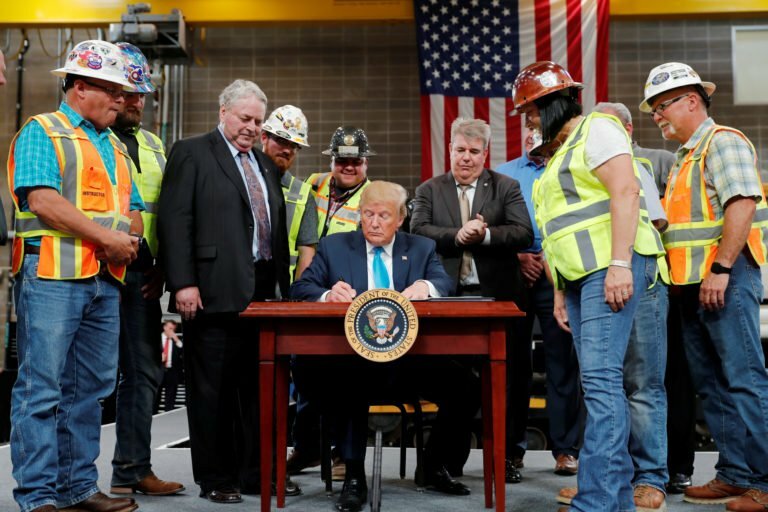 U.S. President Donald Trump signs an executive order on energy and infrastructure during a campaign event at the International Union of Operating Engineers International Training and Education Center in Crosby, Texas, U.S., April 10, 2019. REUTERS/Carlos Barria. Some states, like New York, have used water quality permits to block major gas pipeline projects. Democratic New York Gov. Andrew Cuomo vowed to challenge any changes Trump makes to state permitting authority, despite gas shortages hitting some parts of the state. Democratic Gov. Jay Inslee of Washington, who’s campaigning for president in 2020 solely focused on climate change, also promised to challenge Trump’s planned permitting reforms. Washington used water permitting to block coal and oil export terminals. Trump also ordered the U.S. Department of Transportation to update rules for transporting liquefied natural gas by rail, and make it easier to finance new energy projects. “Too often, badly needed energy infrastructure is being held back by special-interest groups, entrenched bureaucracies and radical activists,” Trump said at an International Union of Operating Engineers training center near Houston, before signing executive orders Wednesday. “This obstruction does not just hurt families and workers like you. It undermines our independence and national security,” Trump said. 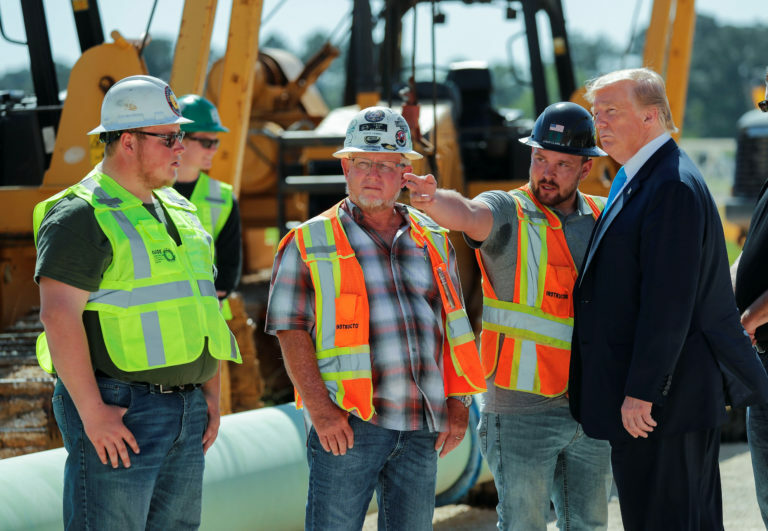 U.S. President Donald Trump talks with workers as he tours the International Union of Operating Engineers International Training and Education Center in Crosby, Texas, U.S., April 10, 2019. REUTERS/Carlos Barria. More pipelines are expected to come online in 2020 to take gas out of the Permian basin, but it may not be fast enough to keep up with the massive production increases. “It’s a black eye for the Permian basin,” Pioneer Natural Resources CEO Scott Sheffield said at an energy conference at Columbia University on Wednesday. “The state, the pipeline companies and the producers — we all need to come together to figure out a way to stop the flaring,” Sheffield said. Why don’t they use it for an enhanced recovery fluid? It is NOT prohibibitively expensive to compress that associated gas and put it back underground for future use or reservoir pressure maintenance. Sure it affects the cost side economics, but the price of oil swings 100% on newspaper headlines anyway. That’s even more prohibitively expensive. This is another insane side effect of mindless eco opposition-to-everything groups. If that gas was piped and sold it would reduce the need to burn other fossil fuels somewhere else. Instead it is just flared off, a total waste for everyone and a direct “carbon footprint” for those stupid enough to worry about such things. “Just say no” is not a useful energy policy. 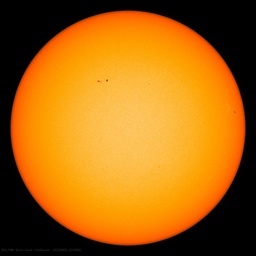 Another issue is that for whatever the large scale use, NG must be gathered and processed, which speaks to energy density. It only makes sense to do so if the economics work. Flaring does seem like a waste but the name of the game is to produce and sell, not store. Perhaps GTL technology will work in some cases. The only place GTL actually “works,” is where the gas is effectively free. Like most other “work-arounds,” when oil is >$100/bbl, the economics don’t look bad. Isn’t NG just Methane, like in cow farts? A-O-C would have a heart attack if she read this article! Actually don’t cows belch out Methane, rather than fart it out? The gas has the same emissions if burnt for heating, electricity generation or just flared off. The difference is solely that, if it’s just flared, the heating and electricity generation will need to come from somewhere else – with extra emissions. So this is actually a green initiative that reduces CO2 emissions. You are absolutely correct. The problem is that logic does not work in discussions with fanatics who deny that people need energy to survive. It is idiotic to waste natural gas, rather than to use it for heating and power. That is just common sense, no computers and modelling required. The problem is stopping pipeline construction is the new green/CAGW anarchy strategy. Anarchy becomes little hitler like dangerous. i.e. It gets power to force our country and industries to do idiotic things which we call ‘green’. ‘Green/CAGW’ political forces have taken over sections of government and are little hitler like using regulations and laws to force actions which do not make sense from a concept standpoint. The atmosphere has plenty of capacity for the life giving plant fertilizer CO2. That phrase doesn’t capture what the true problem of wasting natural resources. Oil companies aren’t in business to preserve natural resources… They’re in business to make money. Associated natural gas from Permian Basin oilfields is worth about -$2/mcf… That’s negative $2 per thousand cubic feet. I have to think that flaring is a very inefficient way to burn gas. There is no control over the fuel/air mixture as there is in heating and generating situations. So I have to think that it is far more polluting to flair than burn. There are thermal oxidizer units used in many places that do a better job of combustion and hide the unsightly flames. These add expense, however. They are mandated in many places. EOR only works for conventional oilfields not shale oil, so you’d have to move the gas to the conventional oilfield – which is the problem. Hmm, coupling Trump’s concepts on addressing the migrant crisis with transporting energy…I wonder how many train cars worth of LNG you’d need to park in various major cities before they’d change their minds about pipelines? That brings to mind the Mississauga Rail Disaster. We also have the example of Lac Megantic. Those should be convincing arguments for pipelines. The Republicans have traditionally supported states’ rights haven’t they? States’ rights are causing problems for President Trump and he is doing things like invoking national security to get around the problem. I’m guessing that this will end up in the Supreme Court (SCOTUS). SCOTUS has shifted to the right. link Does that mean it will or will not support President Trump? The states are misapplying Administration EPA regulations on clean water to block pipelines. The administration is merely clarifying the regulations and their application. I believe that this is a reasonable use of the Constitution’s “commerce clause”. I have no doubt that the framers of the Constitution would agree that a pipeline fits the definition of interstate commerce. States rights only apply to things that are intra-state. A pipeline is inter-state and hence does not fall under that doctrine. Before you decide what the other side should be thinking, please try to understand why they believe as they do. MarkW, what are your thoughts on Wickard v. Filburn ? Don’t try to make them sound reasonable … they aren’t. Tell that to the Confederacy. The right to own people as perpetual property, disposing of them and their children as you would any other useful livestock? That’s a states rights issue? Great news… Except, the Permian Basin isn’t an oilfield. It’s a basin that contains numerous oil plays and many, many individual oilfields. Granted, the unconventional resource plays, which tend to be continuous, blur this distinction. The main problem is the passion of the Left. The fools don’t realize that they are the ones responsible for the policies that necessitate flaring. This is one of the “valve turners” who tried to shutdown a pipeline and opposes NG development at every turn. Fracked gas dangers: reading this may make your head explode. End-times madness, dead ahead. Flaring gas is wasting a resource. That is at least being recognized. It should not be burned off but contained and shipped out, extending the lifespan of those fields. The remaining ~75 percent of gas production is associated with oil, and can even have a negative value, as oil revenue is what drives investment decisions for those wells (Exhibit 1, A). Since this associated gas is largely unaffected by in-basin gas prices, we can expect to see Permian gas production continue to increase even as the takeaway capacity approaches 100 percent. A ban on flaring would shut-in much of that oil production. Is this because in order to get the oil you also tap into gas? Because if it was a gas well, just shut it off. But I don’t really understand much about the process. Almost all oil reservoirs contain natural gas, as free gas (saturated) and/or in solution (under-saturated). The reservoir pressure is considerably higher than atmospheric pressure. When you bring the oil to the surface, the gas comes out of solution and/or flows with the oil. David explained that the Nat gas is solution gas but you may still not be clear. Paul, think of the gas that is in your beer or soft drink …. same concept as u see when the top comes off and the gas comes out … especially with a warm drink. So no … these are oil wells not gas wells and the gas is in the oil as David sez at high pressure and comes out of solution at surface pressure. It seems hard to believe enough gas to power every home in Texas does not have enough value to implement some solution besides just wasting it. 1) Not every home in Texas is powered by natural gas. 2) Marketed natural gas production in Texas is already more than enough to power every home in the State. Marketed natural gas production from Texas is about 20,000 million cubic ft/d… That’s 40 times the 553 million cubic ft/d flared in the Permian Basin. Associated natural gas produced from the Permian Basin oilfields has insufficient value to justify the cost of additional pipeline capacity. Operators could literally pay someone $2/mcf (thousand cubic feet) to take the gas… -$5/mcf less than the current average wellhead price (~$3/mcf). All the best Science explanations make comparisons to beer. This makes the science understandable to the common man. Quantum Leap Beer, I like it. so it’s ENVIRONMENT FRIENDLY to flare it. Why not build a large 10 gw gas-fired power station in the basin, and then pipe the energy out via transmission lines? There is more that one way of solving this situation…. The greenies will block, stall and obfuscate the permitting process for the power stations and power lines every step of the way. Great idea – but it won’t cut any ice with the anti-humanist cadre. They are too blinded by their passion to even grasp such simple logic. Transmission lines and gas pipelines require getting Right of Way across all kinds of private property. Years ago the State of Texas gave instant ED rights to anyone who was moving water. People like T Boone Pickens planned to pipe water from the Olagala Aquifer to the D/FW area under this plan. He wasn’t interested really in moving water since the aquifer is already nearly tapped out, but the law permitted him to get the Right of Way so that the electrical lines from the West Texas wind farms could be built to transmit electricity to the urban centers. Texas will need to get laws that help clear ROW for pipelines and electrical transmission towers too. As long as the pipeline qualifies as a “common carrier,” eminent domain can be used for oil & gas pipelines in Texas. Yet the enviros use every trick in the book to fight pipelines because they will transport “fracked gas.” In my region a $7+ billion pipeline Atlantic Coast Pipeline is stalled right now because the 4th circuit court ruled the pipeline could not cross the Appalachian Trail and the Blue Ridge Parkway “because of the trees”. One judge in the 4th circuit cited “The Lorax” in her opinion. Now get this, 50+ other pipelines already cross those roads and the ACP pipeline is set to GO UNDER them. No tree will be harmed in crossing the trail and parkway. Apparently logic does not enter in this process. The company building the pipeline is going to the Supreme Court. A simpler solution, I think, would be to have portable compressor stations at each flare-off point to bottle gas for company fleet, or other, use. +1, maybe even portable gas generators to catch the wellhead gas and use it for power on site. Local is better. Line loss is large. To be honest, I’m a pipeline operator. Pipelines are not perfect, but for moving things around they are the safest mode of transport and very efficient. Negative is they are fixed and expensive to build. I consider myself to be an old fashioned conservative and support the rights of individual states. But under our Constitution there are certain areas of responsibility of the Federal Government, such as defense. Although the Commerce Clause is often abused, an interstate pipeline is clearly within the purview of the Federal Government. There are some pipelines that operate within a single state, or an intra state pipeline. Imagine aviation commerce with each state setting its own system up for regulating flying. They all stick their fingers in to a point, but air traffic would grind to a halt if the Feds didn’t have the final say. The states are all over our operations as it is. I have folks from all the alphabet agencies from local to the state and the Feds showing up all the time. It’s a wonder we can get anything done. Or… Imagine a State trying to ban ICE automobiles from it’s roads. Actually, it isn’t hard to imagine a state like California doing such a thing! No matter what environmentally friendly solution is found,to sucessfully market this gas,Gang Green will find a way to defeat,logic,reason and practicality. Only illogical pie in the sky ideas will fly. I cannot wait for a political solution,that gives Gang Green exactly what they say they want. I want to see the “Carbon free,plastic less and fossil fuel free future. I want to see the mouthpieces living what they promote. BECAUSE THIS IS WHAT THEY INSIST SHALL BE IMPOSED UPON ME AND MINE. It only goes so far before the people either vote or act. Every election held around the world has pretty much gone more right than usual for the past decades because people have had enough. Then you have the yellow coats in France and others movements like that. The more the media pander to the left the worse it will get. Capitalism is about taking advantage of available opportunities. Set up system of mobile gas powered stations that can be hauled to the places where required and fed into local/national greed network providing steady 24/7 uninterrupted electricity supply. If need be setting up of a high voltage electricity supply line could be faster and certainly cheaper than laying down of a new gas pipeline. Oh, you mean capitalism ? LOL. from an Albertan…..pipeline? what is that? /sarc…. Not to worry. Kinder Morgan is on it, with a new pipeline coming online later this year ( Gulf Coast Express pipeline), and an even larger one due to be completed in 2020 ( Permian Highway Pipeline). Still more are being planned. I don’t think anyone could have forseen the huge amount of output in that region. It’s a temporary bottleneck there, however there are other areas of concern where states and/or individual governors are footdragging. I was born waaaay back, in Midland, Texas, in the heart of the Permian Basin. My entire life I have told people that my very first memory, at about six months old, was seeing a huge fire in the middle of the night. My mother confirmed that she had taken me on a night train to Dallas, and that we had passed by an oil field flaring off gas. Last October I was on a trip that took me through two different paths through West Texas, and I was HORRIFIED by all the wasted energy going on out there. I counted nine different flares within sight at one point. We need to be piping this gas into processing plants and making a profit off of it. There may be helium in some of this gas. Pipe it to the coast and use it for desalination of water if you just want to throw it away. It has always been funny to me that the so-called Progressives are actually very regressive and parasitic to society. They seem to sue every single business and government project that would be a net benefit to society. The Greens should be required to prove that their ideas do actually work..
do the army rations cater for vegetarians ? They can take whatever tools and materials they desire. In Massachusetts there are neighborhoods plastered with signs saying no to pipelines connecting to distribution sites. 7% of gas is imported from Russia each winter mostly because New York has an embargo in pipelines. Thank you Mr. President.